We've grown a little callous when it comes to Lego creations. We blame the internet. After all, with the world 's Lego builders itching to show off their latest Technic and basic block constructions, the bar is set continuously higher. These days, our eyebrows don't arch at anything less than Lego perfection, which is why we're head over heels for the 911 Turbo Cabriolet PDK in the video after the jump. It's pure mechanical obsession in the best way possible. Everything works, from the retractable hard top to hood release. The car even boasts the same steering rack ratio as the real deal. All told, there are over 3,500 parts wrapped up in the vehicle, including eight electric motors, three remote controls and around 21 feet of wire. Even more impressive is the fact that this is no static model. The transmission actually functions and puts power through an all-wheel drive system. Consider our minds effectively blown. 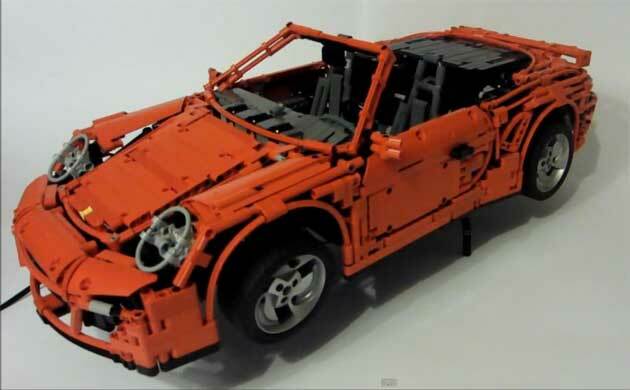 This guy actually built a fully-functioning RC car from scratch out of Lego components. Hit the jump to see it for yourself. but boy this guy needs a girlfriend. watched the whole thing. impressive yes....virgin yes. Okay, I'm sold. Make that into a kit, I want that now!